THE BRITISH MEDICAL JOURNAL GIVES BACKING TO THE ALEXANDER TECHNIQUE. Carolyn Nicholls, author of Body, Breath and Being: a new guide to the Alexander Technique and an Alexander Technique teacher for over 25 years says,"The results of the back pain trial published in the BMJ clearly demonstrate that Alexander Technique lessons are very effective in reducing back pain." The BMJ has just published a report of a year-long trial that shows that taking Alexander Technique lessons can have a long-term beneficial effect on chronic and recurring back pain, significantly decreasing pain and improving quality of life. 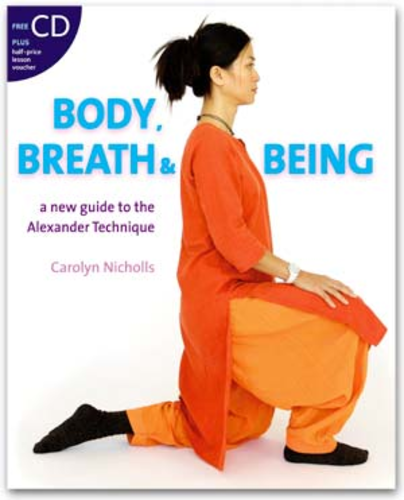 Published in September 2008, 'Body, Breath and Being: a new guide to the Alexander Technique'(D&B Publishing) has finally brought a modern approach to the Alexander Technique and with the current media attention surrounding the Alexander Technique it's timing is perfect! As Tony Buzan says," This book takes the Alexander Technique into the 21st Century." *A keen amateur sportsman who was 'reborn' after being resigned to a lifetime of pain. *A photographer who overcame a debilitating back problem that was interfering with his professional work. *A pregnant woman who used the technique to relieve indegestion and handle her changing posture. *A musician who managed an asthmatic problem that was affecting her playing. *Includes a FREE CD of detailed instructions and advice. Carolyn Nicholls is one of the UKâ€™s leading exponents of the Alexander Technique and has been teaching for over 25 years. She is the founder and Head of Training of The Alexander Technique College in Brighton (UK) and has taught in London, Melbourne (Australia) and Brighton. She presented the F. M. Alexander Memorial lecture in Edinburgh (Scotland), and Wellington (New Zealand). This press release was distributed by ResponseSource Press Release Wire on behalf of D&B Publishing in the following categories: Health, Leisure & Hobbies, Women's Interest & Beauty, Sport, for more information visit https://pressreleasewire.responsesource.com/about.